FileMaker Backup - 360Works SafetyNet Now Has Reduced Pricing! As with all of our products, 360Works SafetyNet was specifically designed with the FileMaker Community in mind. 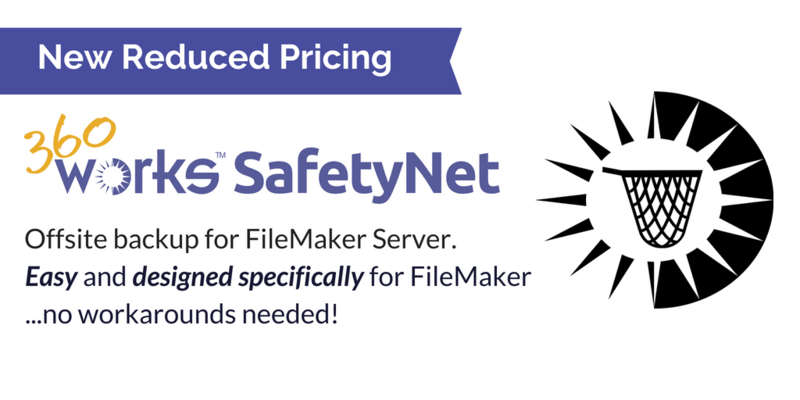 SafetyNet is affordable, reliable, and most importantly...made for FileMaker. SafetyNet is a FileMaker specific backup tool for an offsite backup of your FileMaker Server files in AWS Cloud (S3). SafetyNet adds another level of offsite backup in the event of theft, fire, earthquakes, hardware failure, and other unforeseeable events that could happen to the server. Other third-party backup options may require tricks or workarounds, but selecting SafetyNet as your backup option means you receive an easy backup tool that knows FileMaker...no extra work needed. It gives the peace of mind of having a solid backup strategy involving multiple levels of backup and a consistent schedule designed to work with FileMaker Server. It will back up whatever gets put in the SafetyNet folder (including remote container files), and will remove items if they are removed from the SafetyNet folder. By creating a FileMaker Server scheduled backup with the SafetyNet folder as the destination and selecting multiple days, all of those backup days will be stored in the SafetyNet folder, and it will all be preserved on Amazon S3. Even if you are hosting your FileMaker Server with AWS, be aware that restoring backups with SafetyNet is much, much faster than restoring from AWS snapshots. Snapshots are good for protection against disaster, but they are not fast or convenient to restore from like SafetyNet. We recommend using SafetyNet with if you need security and the ultimate protection of your data. Remote, cloud-based file storage on Amazon S3 - always on! Affordable - new simplified and reduced pricing model! Easy and fast retrieval - one-click operation to automatically archive your old database (if it exists) and replace it with the backup database.